At Least He’s Not Your House Candidate–Oh Wait, He Is! FRIDAY UPDATE: As the Denver Post reports, HD-12 GOP nominee David Reid Ross has decided to, as they say, spend more time with his family. Ross told The Denver Post he submitted his withdrawal paperwork to the Secretary of State’s Office on Thursday afternoon, as time ran short for the district’s Republicans to convene a vacancy committee to replace him. “I don’t know if the Colorado GOP can actually erase my name from the ballot at this stage, but they are going to try,” he had stated on his blog, The House of David, late Wednesday. So ends another budding political career! He’ll always be able to say he was nominated. Westword’s Michael Roberts reports today on newly uncovered writings by David Reid Ross, the Republican nominee for Colorado House District 12–an open seat being vacated by Rep. Mike Foote (who lost his bid for Boulder County District Attorney in June). David Reid Ross is the official Republican candidate for state representative in District 12, an area that includes parts of Louisville and Lafayette. 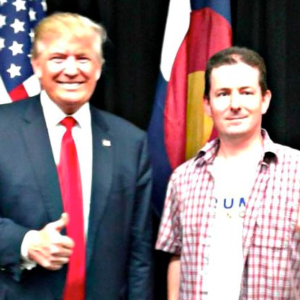 The undated photo above, in which he’s seen posing with President Donald Trump, is included in a voters’ guide created by the Boulder County Republicans. But the Colorado Republican Party now wants nothing to do with Ross after being informed by Westword about The House of David, a personal blog populated by well over a decade’s worth of posts that include rants and musings most sentient humans would regard as racist, homophobic, Islamophobic and more, more, more. In the finest tradition of so many other Republican candidates and even elected officials–here’s looking at you, Jim Welker–who have had their record as a straight-up unapologetic racist, homophobe, and “more, more, more” exposed to the world at a politically inopportune moment, David Reid Ross is set to appear on the ballot in House District 12 in November as a Republican candidate and there’s not much anybody can do about it. It doesn’t look like Mr. Ross has the tether with reality necessary to understand that he is doing both himself and his party no favors by staying on the ballot, even in a district that Republicans have no realistic shot at winning. So now Colorado Republicans can add a House candidate who says “If you love black people: never, never let them vote” to the brand! The time to have done something about this was before Reid won the nomination for this seat. As they say in this business, if you don’t vet ’em, you own them. Thanks for this information. Didn't know this about Ross. But….your verb tense needs changing…. Mike Foote is not "running for Boulder DA,"
but rather "ran for Boulder DA." Foote lost in the primary back in June. It's too bad too, I'm a Foote fan. Perhaps they are just his sincerely-held religious beliefs. Maybe he should open a cake shop. He will have plenty of time to do so. The Denver Post reports that David Reid Ross is withdrawing from the race and the GOP is doing their best Sgt. Shultz impression. They knew NOTHING, NOTHING.. Though they only have until Monday to actually get all the paperwork done if they want to put some other name on the ballot. That's not enough time to call a vacancy committee meeting under by-laws, is it? I cannot find anything about minimum times to call a vacancy committee meeting in the law or Republican by-laws, but it may not be practically possible given the number of people needed for the meeting. Moderanus? Can you rule yourself out? I'm guessing Nutter is planning to pull a Caldera so he can vote for this truly patriotic Merikan. Brings to mind good old Nate Marshall, Republican candidate in House District 23, a few years ago. Turned out that Nate also had not been properly vetted and had some of the same "baggage" Mr. Ross has. Fortunately, he got removed in time, but the replacement didn't campaign much.